My first morning in San Francisco, I decided that it was time to knock Dynamo Donuts off of my hit list. 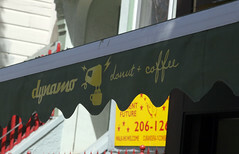 I had been craving a trip to Dynamo Donuts since reading about them on David Lebovitz’s blog almost three years ago. Luckily, it’s only about a mile away from Steve and Emily’s place, and they’ve been there several times, so it wasn’t hard to convince Emily to come with me for a trip to Dynamo. What Dynamo Donuts is about is funky donuts. They are well known for their maple-glazed bacon apple, donuts, caramel de sel donuts, and all sorts of other exotic taste combinations. These aren’t your run-of-the-mill Dunkin Donuts. And they certainly don’t have a Dunkin Donuts price point, either; a typical donut at Dynamo will run you someplace between $2 and $3. But they are very carefully made donuts, made in the little kitchen behind the coffee counter, and made in relatively small batches… So when they run out of a flavor, they’re out. By mid-afternoon most days the one lavish assortment of a dozen donuts has dwindled to a mere donut or two left. 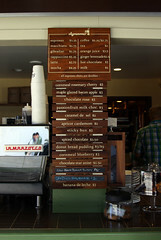 It also gives them variety; while they always carry the bacon donut, and often carry the caramel de sel donut, the rest of the menu can and does vary, with donut flavors including spiced chocolate, chocolate rose, banana de leche, cornmeal blueberry, and apricot cardamom, just to name a few I saw on my trips. But, being my first time to Dynamo, I had to opt for the two donuts I had heard the most about: the maple-glazed bacon apple, and a caramel de sel. Both of these were outstandingly good donuts. The bacon donut was actually fairly subtle in both bacon and glaze, with a nice flavor profile overall. The apple note was soft, the glaze sweet and maple-flavored without screaming “Maple!”, and the bacon gave more of a smokiness and slight crunch than an outright bacon note. Really, it worked well. The caramel de sel was a lot more out there: the donut itself very yeasty, the caramel very sweet, and the salt in nice little compact salt bombs. Certainly a good combination, but like salty caramel ice cream, a combination that I do like to take in moderation. A nice macchiato, followed by a coffee from the very good Philz Coffee down the street as I walked home, and I was nicely satisfied with my trip to Dynamo. However, while I was there, I saw several people get both the chocolate spice and chocolate rose donuts., and they looked wonderful. And several of my tivocommunity friends also in town for the March saw my bacon donut photos and wanted to experience Dynamo for themselves. 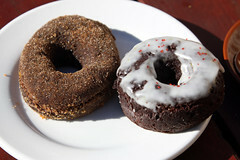 So the very next morning, I again got up on the early side and made the walk over for a second visit to Dynamo in as many days, getting one each of the chocolate spice and chocolate rose donuts. To me, both of these donuts were excellent and showed the breadth of Dynamo’s donut making ability, being very different than the previous day’s donuts. 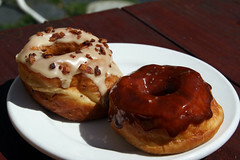 The bacon and caramel donuts were both yeasted and risen donuts, while both of these were cake donuts. And unlike most cake donuts, both of these were fried up with a most excellent crispiness, giving them a nice moist cake interior and a firm, crisp crust. This is what donut-making is about. Add in some nice spicing (basically a chai-like blend on the chocolate spice one, and rose on the other), and add a near-perfect glazing to the chocolate rose one, and you’ve got donut perfection. Perhaps even more so than Gourdough’s, which I visited earlier in the month. Really, this place isn’t to be missed. I’m glad this place isn’t down the street from me. I’m having to work out enough already these days, I don’t need a donut habit as well. Well, the next day in Brussels, we again decided to set off for Bruges, and this time we were successful—no drama with the rental flat, and the trains were running on time. So by mid-morning we had arrived in Bruges. Bruges is an interesting little city; it’s the capital of the Belgian province of West-Flanders (and distinctly in the Flemish part of Belgian: put away your French, folks, you won’t be needing it here). It’s also, by deliberate choice, retains a rather substantial medieval feel, between the authentic (Gothic period buildings), semi-authentic (Bruges had a rather substantial Neo-Gothic movement in the 19th century), and modern building codes (intended to keep things looking Gothic), it’s been fairly successful. The result is something halfway between authentic and touristy, but it’s a pleasant destination nonetheless. We did most of the standard Bruges tourist things, including walking along the canals, drinking beer, and climbing the Belfort (Belfry, the central tower in Bruges). After a round of that, we were ready for some lunch. As was, well, the rest of Bruges, including the tourists. But consulting one of several of our tourism guides, a mere block from the central Grote Markt we found Den Amand, a small bistro.